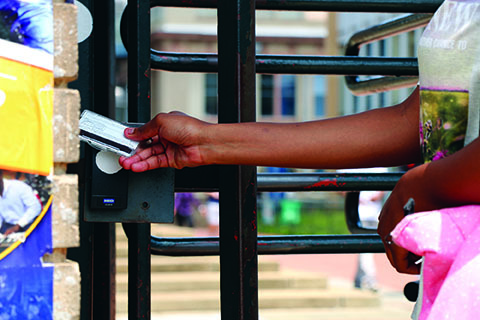 A new biometric system is being introduced at Wits to reinforce safety. WITS will install 300 new fingerprint scanners at entrances across the university this year in an attempt to improve security at the institution. According to Wits Technical Security Solutions Manager Ariel Moshiga the installation of the new biometric system, made up of 300 scanners, will be installed on Main Campus as well as Education, Med School and Business School. “We’re going to implement the biometric at the perimeters (of the campuses), at your entrances only,” said Moshiga. This will include both pedestrian and vehicle entrances. Wits students and staff will have to enrol their fingerprints to use the system. This is expected to be completed between June and July of this year. According to Moshiga, each member of the Wits community will enrol four fingerprints on each of their hands and receive a new student card linked to their prints. Moshiga said visitors to Wits will have to produce a form of identification which will be scanned upon entrance. “It’s to keep the students safe. The theft of motor vehicles, it will stop most of those. We’re trying to avoid having people loitering around the entire place,” Moshiga said. Director for Protection Services Mokgawa Kobe said the new system will improve security on campus. “Biometric is the most reliable way of access control. It would enhance security, students won’t exchange their cards, students won’t open for strangers,” Kobe said. According to Moshiga, Wits’ plans to expand the biometric system to include the entrances of libraries and dining halls. Third-year BCom Accounting student Maxene Fonseka told Wits Vuvuzela that using fingerprints was invasive although the new system would improve security. “With lots of the stuff that went on during Fees Must Fall regarding people that weren’t part of Wits, how they could get in, and actually pretty easily, that makes you wonder how secure the access actually is to campus,” said Fonseka. First-year BA General student Jason Leonard said using fingerprints for access would be reassuring. “I think it would be a welcomed measure, I’d feel a little bit safer on campus if it were in place,” he said. Moshiga said there will be 30 enrolment stations across all Wits campuses in the next four months.